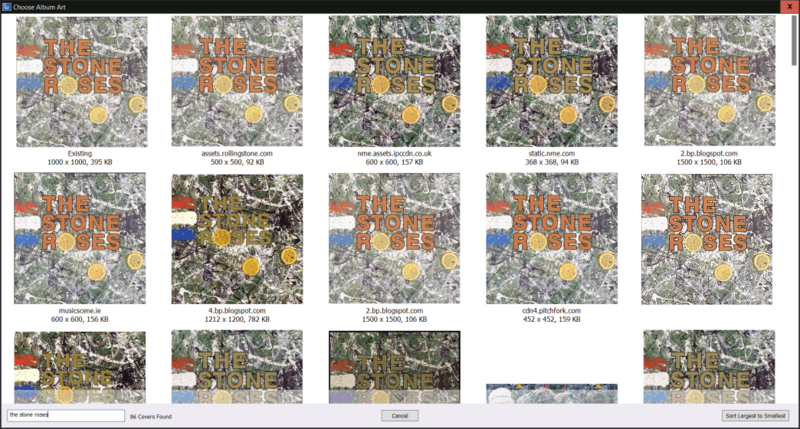 GD3, Discogs, SontaDB, Musicbrainz & freedb, provide rich names & high resolution album artwork. Ripping and encodes uses all CPU cores simultaneously (as required). Multi-Encoder encodes to many formats at the same time. process the audio with Volume Normalize, or HDCD decoding to 24 bit. 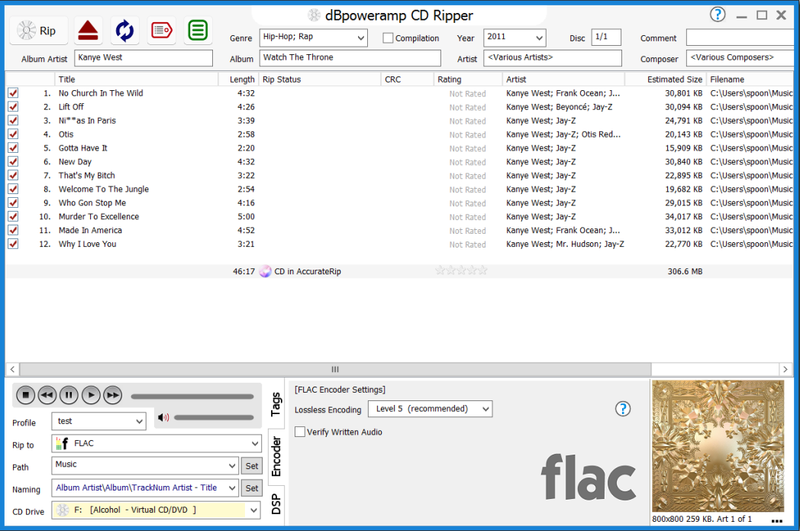 dBpoweramp is a fully featured CD Ripper. Free Rippers come with a little extra (a spying toolbar, Trojan, malware, or virus), dBpoweramp has never bundled in 15 years, those wanting a CD Ripper, get just that and only that. No Trojan, no malware, no viruses. C2 pointers, HTOA, removal of drive offset & audio cache, advanced features expected to rip with optimum efficiency. For Windows 10, 8.1, 7, Vista & XP (SP3), OS X Mavericks or newer. Unicode and 64-bit compatible. dBpoweramp is free from spyware, malware and Trojans, our installer does not bundle other programs. AccurateRip compares your rip with the results from other people, if AccurateRip says your rip is error free, it is. dBpoweramp is able to obtain previously un-achievable levels of error recovery, through re-reading, c2 pointers and AccurateRip v2 (cross pressing verification). Illustrate invested huge resources redesigning how secure rippers function. In short, don't just rip your CDs, AccurateRip them. Encoders dBpoweramp offers this full range of audio encoders:mp3, m4a (AAC iPod & iTunes), Windows Media Audio (WMA), Ogg Vorbis, FLAC, Apple Lossless (ALAC) to name a few. Multi-Encoder encode to multiple different formats at the same time, have FLAC for archive and PC playback and mp3 for portable player. CD Ripper encodes using all CPU cores simultaneously (up to 16 cores as required). PerfectMeta™ uses 5 meta data providers simultaneously, allowing inevitable spelling mistakes to be corrected. PerfectMeta offers the best metadata solution obtainable today. Many competitors rely on a single provider, which can be sadly lacking, PerfectMeta	uses premium meta providers: SonataDB (Classical) and GD3, in addition to MusicBrainz, Discogs and freedb. 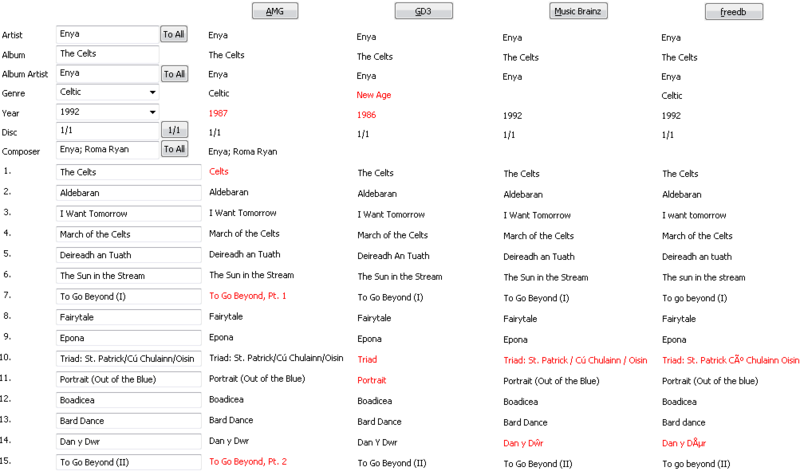 SontaDB is a new classical database with extended fields: Composer, Conductor, Period, Instrument, Orchestra, Soloists. As you can see there are lots of corrections (red elements) taking place, the final meta data is shown the left hand side). All metadata providers had errors, but the final corrected result exactly matches the CD, truly remarkable. Digital Signal Processing (DSP) effects which can be applied whilst ripping, many effects such as decoded HDCD's to 24 bit (Windows only), or industry standard EBU R128 volume normalize. 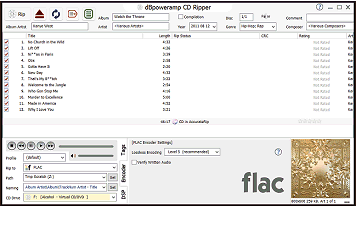 mp3 Converter included as standard (dBpoweramp Music Converter), convert and tag your existing files. CD-Text, UPC, ISRC: metadata embedded on some CDs.